Synopsis: An angel helps a compassionate but down-on-his-luck and despondent businessman by showing him what life would have been like if he had never been born. Did You Know? The film was originally set to be released in 1947. However, prints for RKO’s Sinbad, the Sailor were not released in time for its Christmas release of 1946. 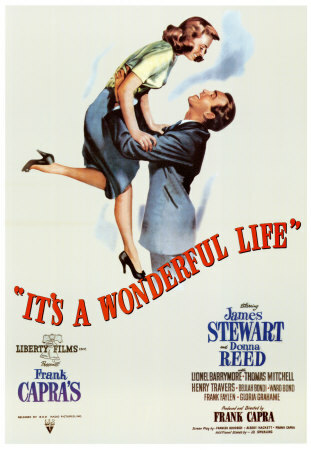 So It’s a Wonderful Life was rushed into theatres, attributing to its flop at the box office and subsequent failure at the Academy Awards. Quotables: GEORGE: I wish I had a million dollars. HOT DOG! It truly is a travesty that It’s a Wonderful Life was not a success at the Oscars. It’s one of the best films of all time, and it deserved everything it was nominated for and more. I am quite frankly surprised that James Stewart was the only one who received an acting nomination. Donna Reed, Lionel Barrymore, and Henry Travers easily deserved nominations as well. It has so much heart, and it makes me cry at least 3 or 4 times throughout.